Soul Sacrifice Delta, the expanded, enhanced version of the nightmare-ish Monster Hunter-style action game launches on the PS Vita today along with Borderlands 2. PS3 (and soon, PS Vita) owners can get the next The Walking Dead: Season 2 episode (our review here). Serious Sam 3: BFE is also finally available to download too. 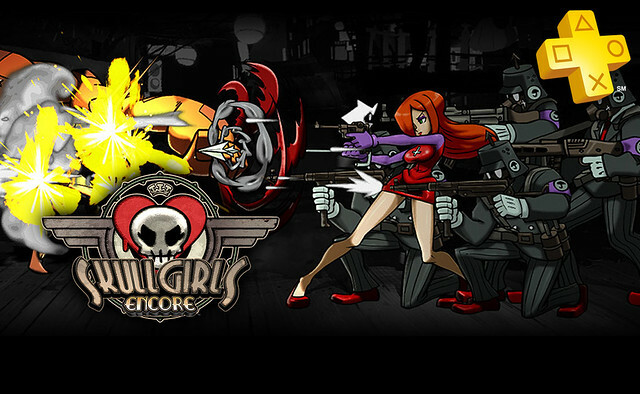 Skullgirls Encore is the PS3 freebie for PS Plus members, so make sure to queue it up. Get two legendary RPGs on PlayStation 3 system for one great price! Tales of Graces f — Journey through a world full of political intrigue and strife, explore dungeons and fight your way through fearsome adversaries! Tales of Xillia — Follow Jude Mathis and Milla Maxwell at the outset of their adventure through the world of Rieze Maxia. The critically acclaimed and bestselling role-playing-shooter hybrid, Borderlands 2, is now available for the PlayStation Vita system! Stuffed with 6 Add On Packs, Borderlands 2 on PS Vita system delivers hours upon hours of signature addictive Borderlands nonstop loot-shoot gameplay. Soul Sacrifice Delta is is the ultimate edition of Soul Sacrifice where every decision has consequential results. The action RPG that pits you against an evil sorcerer returns with a slew of new features including improvements to gameplay, graphics, new levels, characters and spells. Grim, the faction who believes in neutrality in all things, joins the blood thirsty Avalon and the merciful Sanctuary, and adds a third angle to bring the Delta in Soul Sacrifice. Go behind the scenes with Global Superstar Ricky Martin for the making-of “SuperSong”. Earlier this year, Sony and Ricky Martin invited aspiring musicians from around the world to submit videos of their original song proposals to compete for a chance to be on the Official Album of the 2014 FIFA World Cup Brazil. Elijah King won with his song “Vida” and is now poised to become a world-wide music star. Watch “SuperSong” now on your PlayStation 3, PlayStation 4, and PlayStation Vita. Go to http://www.crackle.com/c/supersong for more information. This season Crunchyroll is loaded with all the brand new, highly anticipated series like, “Jo-Jo’s Bizarre Adventure”, “Black Bullet” and “Nanana’s Buried Treasure,” along with the return of fan favorite: “Fairy Tail.” But that’s not all, since we have over 50 simulcasts this season, you can rest assured that there’s something for everyone! For a 14 day free trial, click here. Just like the nightly news. Only weeklier. John Oliver comes to HBO with an all-new, Sunday-night forum. A topical look at the week in news, politics and current events. Catch up on Last Week Tonight with John Oliver now with HBO GO on PS3. Watch the trailer here. For subscribers this week, be sure to watch the premiere of Pain & Gain starring Dwayne “The Rock” Johnson and Mark Wahlberg! Also added to our collection are classics like Demolition Man, Bad Boys and Jumanji. Get ready for the new Godzilla by checking out our “Go Go Godzilla” collection of 6 classic adventures from this legendary movie monster! Also look for hits like Ride Along, The Nut Job and I Frankenstein…. now available either at the kiosk or to rent and buy digitally! Finally, it’s easy to own titles like Pompeii, 3 Days to Kill and Endless Love…available now to BUY. Don’t have Redbox, sign up here. WWE is going animated. See what happens when John Cena, Randy Orton, Big Show, Kane and some of your favorite WWE Superstars exit the ring and enter Slam City. New stories, New Adventures… Same WWE attitude. Check out new episodes on WWE Network. Don’t have WWE Network? Subscribe today!